Elder-care technologies are broadly defined as products and systems that increase the health status and quality of life for seniors. Information and communications technologies can help enhance the quality and efficiency of care provision, thus improving both the aging and caregiving experience. Monitoring technologies have the potential to improve older people’s safety, manage their health and assist them in maintaining their independence. Additionally, these technologies hold the promise of enormous cost savings for the healthcare system by enhancing the ability of providers to provide timely intervention prior to a patient’s deterioration requiring acute care. Elder-care technologies include two groups of monitoring systems: home telehealth and safety monitoring. Home telehealth is the use of technology to deliver care in a patient’s place of residence and includes monitoring of the patient’s physiological parameters and symptoms, as well as education about the patient’s condition. Safety monitoring includes assist-call devices, medication-management products, wander-management systems, fall-management devices, smart home systems and robotically enhanced mobility-assistance devices. Elder-care technologies represent a critical segment of the health information technology (HIT) industry. Storage, retrieval, sharing and use of healthcare information for decision-making and ultimately communications mark the cornerstones of HIT. The integration of these technologies represent a rapidly growing segment of the HIT industry, one that is paramount to developing a higher-quality, more efficient continuum of patient care. According to BCC Research's Technologies for Long-Term Care and Home Healthcare: Global Markets (HLC079C), the global market for these elder-care technology products was valued at $3.7 billion in 2014, and is expected to grow to roughly $10.3 billion in 2020 at a healthy compound annual growth rate (CAGR) from 2015 to 2020 of 18.8%. Based on data in its report HLC014G Global Markets for Telemedicine Technologies, BCC Research estimates the U.S. market for home telehealth monitoring systems in 2014 to be worth approximately $982 million. Future growth in this market will be driven by factors such as growing physician acceptance, rising hospital and nursing home costs, and private and public health insurers’ efforts to control the costs of patient care. As a result, the U.S. home telehealth market is expected to reach $1.2 billion in 2015 and over $3.5 billion in 2020, with a significant 23.7% CAGR from 2015 to 2020. In response to the socialized medicine model that is widely present in Europe, governments, particularly at the local level, are incentivized to contain the use of acute medical services. Europe has a tradition of providing wellness and preventive care. These factors are reflected in the EU market for home telehealth equipment, which was valued at $540.3 million in 2014. The European market is projected to grow faster than the U.S. market, with a CAGR of 26.2% from 2015 to 2020. Growing at this rate, the European market should reach $681.9 million in 2015 and almost $2.2 billion in 2020. The market for home telehealth systems outside the U.S. and Europe is also expected to grow rapidly (at a CAGR of 18.6%). At this rate, the market in these other countries should increase from $760.7 million in 2014 to $906.9 million in 2015 and over $2.1 billion in 2020. The challenge in quantifying the elder-care safety market is that the core technologies are used in multiple, overlapping applications. Additionally, complicating quantification is a lack of consensus in defining the markets and distinguishing between the unique merits of each application. Elder-care safety-monitoring markets include technologies associated with assist-call systems (e.g., elements of wander management and fall prevention), smart home (e.g., elements of fall detection and medication management), and smart mobility devices. In the $449 million U.S. market for elder safety-monitoring technology in 2014, component technologies consist of several segments in various states of adoption. Assist call is the most mature market. Smart home could be classified as an emerging market, and smart mobility devices currently have no significant commercial market in the U.S. BCC Research projects that the total U.S. market for elder safety-monitoring technology will grow at a steady CAGR of 10% over the next five years, reaching $493.2 million in 2015 and $793.8 million in 2020. 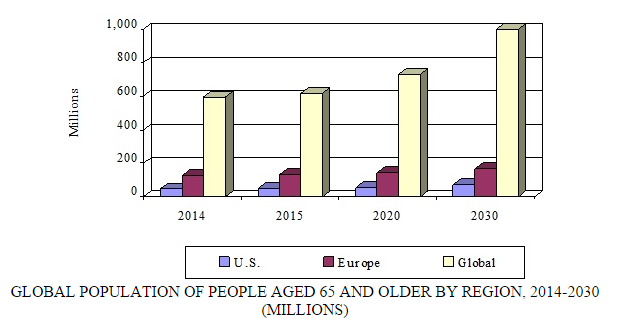 Like the U.S. market, the $780 million European market for elder safety-monitoring technologies in 2014 consists mainly of assist-call devices. The smart home segment of the European market is less developed than its U.S. counterpart, and the smart mobility devices segment is expected to remain relatively undeveloped through 2020. In all, the European market is expected to grow to $854.4 million in 2015 and nearly $1.4 billion in 2020, a CAGR of 9.7% over the next five years. Other geographical markets as a group accounted for sales of $203 million worth of elder safety-monitoring technologies in 2014, most of it in assist-call technologies. Collectively, these markets are expected to grow to $224.7 million in 2015 and $367.1 million in 2020. The latter figure includes $10 million worth of smart mobility devices, virtually all of them expected to be sold in Japan.